Without the need of a third-party app or other memory trick, it'll be much easier to remember where you've parked thanks to a Google Now update. As the rumor revealed, the predictive software will take advantage of your phone's sensor to detect when you've left a moving vehicle. That means, hopefully, you'll no longer wander aimlessly around any more parking lots. We've all been there, and it's an incredibly frustrating experience. That may or may not have happened to us in Las Vegas during CES earlier this year. Going forward, Google Now will present users with a location card that will pop up with a pin, showing exactly where you last left your car. 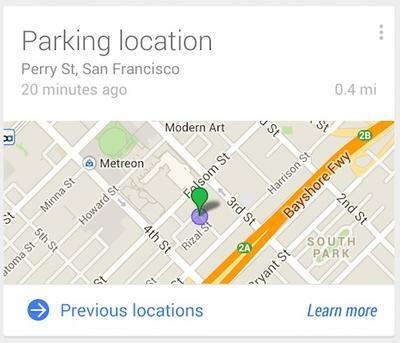 You can even see where you parked previously; Google said none of this information will be shared with anyone else. The card should start popping up once enough information is gathered, so keep an eye out for it. And if you don't own a car, the card will still show up—say, for example—if you took the bus or train. You can, however, change settings to choose when that card will show up, or even just turn the card off entirely. It's the little things that add up. If you've ever lost your car at a theme park or sporting event parking lot, this update should definitely come in handy. There are other methods to remembering where you parked, such as taking a picture. But this is effortless and easy, and should save people from having to wander a vast and endless parking lot when, Oh yeah, you remember after 30 minutes of walking around that you parked on the other side.